The men in the Petty family are known for a few things. One is baldness. Most men go bald at some point in their twenties. Tony still has a full head of hair, much to his disgust. The Pettys are also known for making bib babies. Tony's grandma's first son weighed 14 pounds at birth. I have been warned of this "Petty curse" and didn't think too much of it. After all, that was at least fifty years ago when he was born and she went two months past her due date. In addition, Tony and I had normal birth weights. So, of all the things I had been worried about, this was not one of them. Last week at my appointment, my midwife said I was measuring large and wanted to have an ultrasound done. I was measuring 37 and at most should have been 34, according to her. So today I went in for my ultrasound. Everything looks wonderful. His heart has all four chambers with a good heart beat, he has all of his limbs, his head is already positioned low, and the tech was even able to see that he has hair. The first measurement was his head. 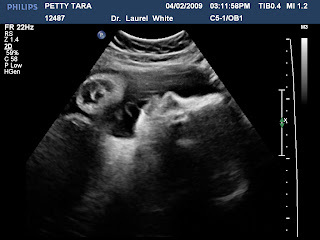 I am 33 weeks along and his head measured 35 weeks. Once the tech was done, she said that according to their estimates he already weighs 5 pounds, 6 ounces. And he is supposed to gain half a pound each week, with 7 weeks left. Yikes. If these numbers are accurate and I go full term, I will have a very big baby. It is so exciting waiting for the little one to arrive. All the questions will be answered like "who does he look like" and "how long/big is he". It is so special. It was really nice seeing you the other weekend. You look really good.